This week, King of Moe has his spot in the limelight. 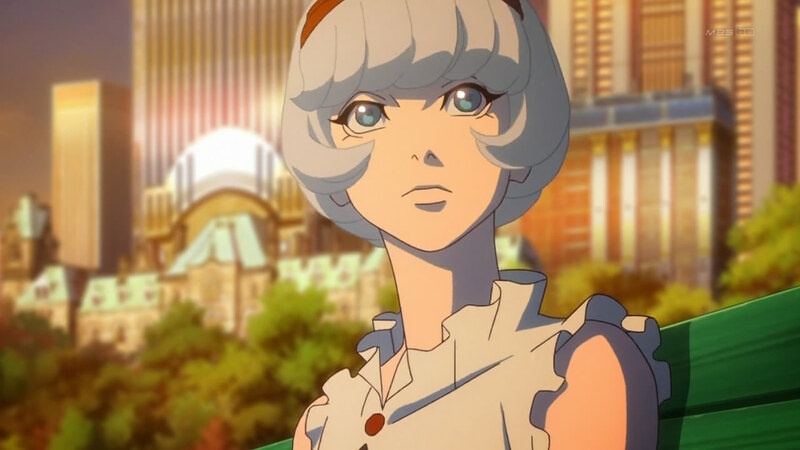 And Tiger & Bunny is a really cruel show to the nicest of the nice guys. The episode we’d been looking forward to ever since we saw Keith alone in the back alley, where it was very lonely. And because we follow Go Inoue, Keith’s seiyuu on Twitter we weren’t the least bit worried about something really bad happening to Sky High. He was so childishly enthusiastic about it so it didn’t spell doom for his character. First half of the episode is a joyride of hilarity, from that photoshoot to the Girls’ Team giving love advice to Keith and what the hell was that commercial Tiger and Barnaby were in? Even Keith’s dog’s name gave us giggles… He’s called John. Our money is on a nod to John Goodman, the actor. The creative team seems to be having a lot of fun coming up with ways to embarrass the characters, and along with it also us poor watchers. We were really happy to see Girls’ Team get some screen time, hope they’ll show us more of those girls’ night out scenes. After a week of rampant speculation about just who that girl in the preview was and what she was to Keith, we get the answer. Those who called that she was a robot, congratulations, you win! The story about Keith’s troubles on coming to terms with not being able to meet people’s expectations after dropping to second place in the rankings seems like the main plot of the episode, but the important stuff happens around Barnaby. The episode offers more questions than answers so we decided to split the biggest speculah into its own post. But it doesn’t pay to be a nice guy in this series, and Keith’s one-sided lovestory with Cis is short lived. We don’t want to see an unhappy Keith, he should smile and be goofy. It’s a bit painful to watch how the nice guys are treated. Both Keith and Kotetsu are almost too nice for their own good, Keith with his natural goofiness and Kotetsu for his caring dorkiness. And well, Kotetsu… The epilogue part drops us a bomb. Something is happening to Kotetsu’s NEXT power and he may actually be losing it. We’re not drawing too hasty conclusions yet, but we have some theories. Losing his power would be a massive blow to Kotetsu since being a hero and doing good for the public is very important to him. The other big revelation this week was about Barnaby’s parents. They were researching androids that could be used to help people. 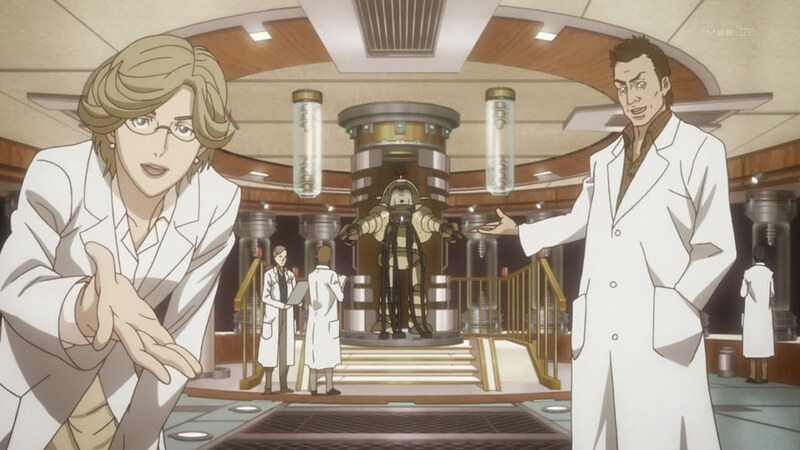 The scientist who created Cis, Rotwang (thanks to Esther for clarification, the character’s name is a nod to the classic film Metropolis), took over their research after they died and continued it to create an android that would surpass both humans and NEXTs. Rotwang himself seemed to be a few crayons short of a full box so we don’t think he had anything to do with the murders of Mr. and Mrs. Brooks, but maybe someone who could benefit from the research Rotwang wanted to do got rid of them so he could do it his way? Sunrise isn’t giving us enough plot, so it’s hard to tell if all of this is tied together, or how it is tied together if at all. Barnaby has some difficulty handling his emotions still. He looks away when he talks about his parents with Kotetsu, and he clearly wipes a tear when Keith comes to interrupt them. His memories of his parents are very idealized, and he’s torn about not knowing for sure what they really wanted with their work. It seems that with Barnaby’s parents becoming more important to the story and Kotetsu’s powers changing, they’ll need each other’s support more than ever. Barnaby doesn’t have other people he could really confide in, and knowing Kotetsu he’ll try to downplay his diminishing powers as long as he can though he really shouldn’t. This week’s title was a direct reference to Sky High and him restoring the faith in his own abilities. The ellipsis in the title – instead of full stop like in all the other titles – left me feeling like it punctuated the tragedy of it all. Cis got Keith to face himself, and yet he unknowingly destroyed her (or should I say “it”). The bit where he went back to the park bench to wait for her was heartbreaking. 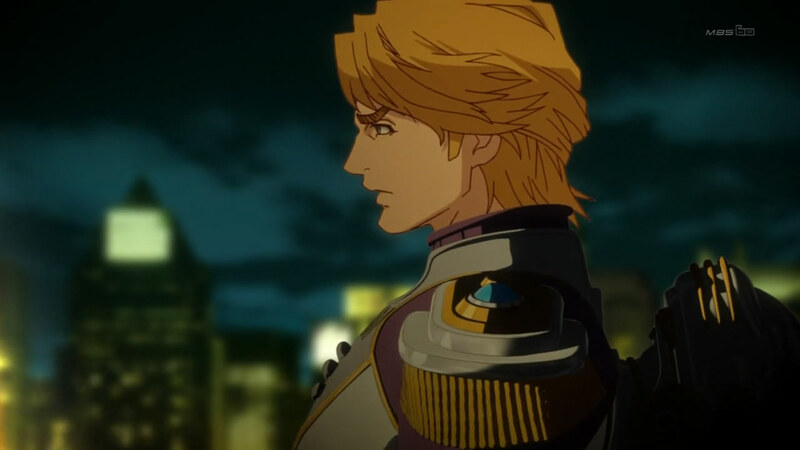 Lunatic is going to appear again next week and the episode title hints at more truths being uncovered, possibly something more about either Barnaby’s parents or what’s happening to Kotetsu. 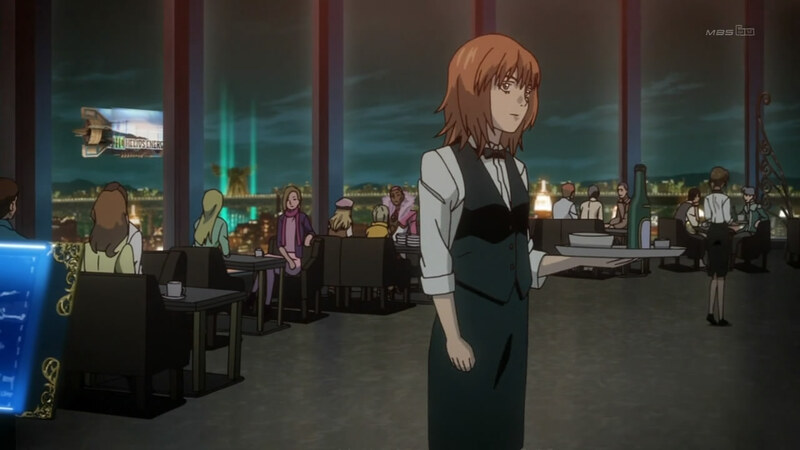 It’s also possible that Barnaby will start figuring out that something is going on with Kotetsu, since even when Kotetsu’s powers didn’t get the boost in this episode like they got it in episode 14, they still ran out faster than the usual 5 minutes. OMG! Scarf-tan has a job! Animation was much better this week. Seems that the budget has finally caught up with the production after the series turned out to be a hit, and hopefully it’ll stay this way to the end now. Next set of BDs should show more fixes to animation since the derps started increasing from episode 5 onwards. We were also extremely relieved that Barnaby’s deredere side was toned down this week. As wonderful as he is in total Kotetsu-fanboy mode, it’s a bit exhausting. They can still banter and Barnaby’s tsuntsun does a small comeback. Rotwang is German and means “red cheeks”, which I thought was strange, since his red and not his cheeks. Ah thank you very much for the clarification! I’ve seen Metropolis once but it was a very long time ago so I didn’t remember that detail. It wouldn’t be the first time they mess a detail like that in anime.